SOLAS Science and Society kick-off workshop was held in Brussels, in October 2016. A review paper 'A New Perspective at the Ship-Air-Sea-Interface: The Environmental Impacts of Exhaust Gas Scrubber Discharge' which developed from this workshop has been published! Read the paper here. Download and read issue 9 of the SOLAS event report. Issue 9 reports on the workshop on 'Remote Sensing for Studying the Ocean Atmosphere Interface', which took place in Potomac, Maryland, USA, in March 2018. 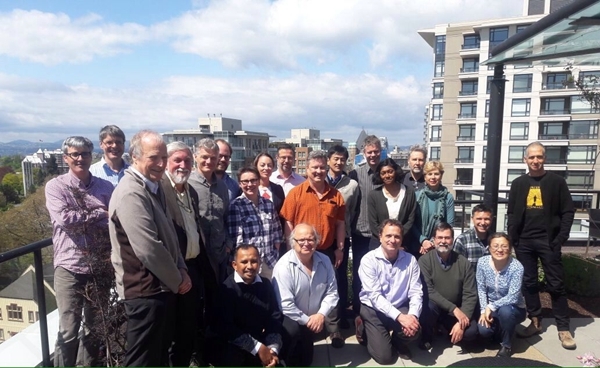 SOLAS annual SSC meeting 2018 was held from May 2-4, in Victoria, Canada. We sincerely thank all the sponsors, SCOR, Future Earth, iCACGP, WCRP, University of Victoria, ONC, PCIC, PICS, CNC/SCOR for their valuable support! The scientific focus of this subcommittee is on ocean-atmosphere interactions and their role in marine biogeochemical cycles. There is a substantial overlap between the scientific goals of the OCB and SOLAS communities, and this subcommittee seeks to strengthen communication and collaboration between ocean and atmospheric scientists to create a thriving, collaborative air-sea interaction research community in the US. Information about the new members and details here. The workshop will be held during 28-31 October 2018, at the UCLA Lake Arrowhead Conference Center. The applications to attend the workshop will be received from mid-April onwards and the application deadline is 1 June 2018. More information here. The 3rd Integrated Carbon Observation System (ICOS) Science Conference, 11-13 September 2018, Prague, Czech Republic. Submit an abstracts by 18 May 2018 here. OCB 2018 Summer Workshop, 25-28 June 2018, Woods Hole, MA, USA. Register by 20 May 2018 here. The 3rd Atlantic Project Awards 2018. Apply by 21 May 2018. Details here. Apply for AGU Vice Chair for the 2020 Ocean Sciences Meeting by 24 May 2018. Details here. Svalbard Integrated Earth Observing System (SIOS) is looking for early career scientist to join the editorial board for the State of Environmental Science in Svalbard (SESS) report. Apply by 25 May 2018. Details here. Call for nominations for six WCRP expert panels, including Data Advisory Council (WDAC), Modeling Advisory Council (WMAC), Working Group on Coupled Modeling (WGCM), Working Group on Subseasonal to Interdecadal Prediction (WGSIP), Working Group on Numerical Experimentation (WGNE, joint with WMO CAS), and CORDEX Science Advisory Team (CORDEX-SAT). Submit a nomination by 30 May 2018. Details here. The 4th CLIOTOP Symposium: Oceanic biodiversity under climate change: Shifts in natural and human systems, 15-19 October 2018, Keelung, Taiwan. Submit an abstracts by 31 May 2018. Details here. The IV International Conference on ENSO, 16-18 October 2018, Guayaquil, Ecuador. Submit an abstract by 31 May 2018 here. PAGES Early-Career Network call for Regional Representatives. Apply by 31 May 2018. Contact here for details. Workshop on 'Introduction to the Awesome OCIM', 12 August 2018, MIT campus, Boston MA, USA. Register by 1 June 2018 here. GEOTRACES-PAGES Synthesis workshop: Trace Element and Isotope Proxies in Paleoceanography, 3-5 December 2018, Aix-Marseille, France. Pre-register by 1 June 2018 here. IPBES Call for nominations of experts for assessments from Intergovernmental Science-Policy Platform on Biodiversity and Ecosystem Services (IPBES). Submit a nomination by 1 June 2018. Details here. The 3rd and final workshop: Ocean circulation and carbon cycling during the last deglaciation: global synthesis, 6-9 September 2018, Cambridge, UK. Submit and abstract and by 1 June 2018. Details here. The 2018 Galapagos Ocean Acidification School, 19-28 August 2018, Galápagos, Ecuador. Apply by 4 June 2018. Details here. EurOcean special event to pay tribute to its co-founder, Prof. Mário Ruivo, and to raise awareness on Ocean Literacy, 6 June 2018, Brussels, Belgium. Free registration here. Call for nominations for the 2018 iCACGP Paul J. Crutzen Award for Early Career Scientists. Apply by 10 June 2018. Details here. The European Ocean Observing System (EOOS) call for feedback on the draft EOOS strategy and implementation plan 2018-2022. Submit your feedback by 15 June 2018 here. Nominate candidates for EGU awards and medals by 15 June 2018. Details here. Call for expert reviewer for the IPCC Special Report on the Ocean and Cryosphere in a Changing Climate. Register by 22 June 2018 here. Frontiers Research Topics: We Shed Light: Optical Insights into the Biological Carbon Pump. Submit a manuscript abstract by 29 June 2018 here. Call for external review of the second order drafts of chapters, and the first draft of the Summary for Policymakers of the IPBES Global Assessment of Biodiversity and Ecosystem Services. Register and review by 29 June 2018. Details here. The 1st Advanced Zooplankton Course, 22 October-2 November 2018, Naples, Italy. Apply by 30 June 2018. Details here. Call for a new host for the IMBeR International Project Office. Submit an expression of interest by 30 June 2018. Details here. Nine working group proposals have been submitted for consideration at the annual SCOR meeting in 2018 (see proposals here). SCOR welcomes input from national SCOR committees, partner organizations, and any other groups and individuals interested in sending comments. The specific instructions are available in the Call for WG Proposals. Comments are due by 1 August 2018. Decisions on which group(s) will be funded will be made at the SCOR annual meeting on 4-7 September 2018 in Plymouth, UK. Gordon Research Conference on 'Towards a Global Representation of the Impact of Ocean Mixing Processes on Large Scale Circulation', 3-8 June 2018, Andover, NH, USA. More information here. GEO Symposium, 11-12 Jun 2018. GEO Climate Workshop: Earth observations for the Paris agreement, 13 Jun 2018. Geneva, Switzerland. Details here. POLAR2018 Conference, 15-26 June 2018, Davos, Switzerland. More information here. The 2018 OCB Summer Workshop, 25-28 June 2018, Woods Hole, MA, USA. More information soon here. IOCCG Summer Lecture Series 2018 'Frontiers in Ocean Optics and Ocean Colour Science', 25 June - 7 July 2018, Villefranche-sur-Mer, France. More information here. Gordon Research Conference on Elucidating Microbial Processes Across Spatial and Temporal Scales, 1-6 July 2018, Lucca, Italy. More information here. The 7th international Ra-Rn workshop, 2-6 July 2018, Delmenhorst, Germany. More information here. The International Meeting on Marine Research 2018, 5-6 July 2018, Peniche, Portugal. More information here. Gordon Research Conferences on Ocean Biogeochemistry, 8-13 July 2018, Hong Kong, China. More information here. The OCB Biogeochemical Profiling Float Workshop, 9-13 July 2018, Seattle, USA. More information here. Workshop on 'Introduction to the Awesome OCIM', 12 August 2018, MIT campus, Boston MA, USA. Register here. Fundamentals of Atmospheric Chemistry and Aerosol Modeling Workshop, 13-15 August 2018, Boulder, CO, USA. More information here. Ocean hackweek 2018, 20-24 August 2018, Seattle, USA. More information here. 2018 SCOR Annual Meeting, 4-7 September 2018, Plymouth, UK. More information here. PAGES' Ocean Circulation and Carbon Cycling: Ocean circulation and carbon cycling during the last deglaciation: global synthesis, 6-9 September 2018, Cambridge, UK. More information here. The 15th International Circumpolar Remote Sensing Symposium, 10-14 September 2018, Potsdam, Germany. More information here. Potsdam Summer School 2018, 10-19 September 2018, Potsdam, Germany. More information here. EuroGEOSS Workshop 2018, 12-14 September 2018, Geneva, Switzerland. More information here. The 8th China - Japan - Korea IMBeR Symposium, 17-19 September 2018, Shanghai, China. More information here. 2018 iCACGP/IGAC Early Career Short Course, 22-24 September 2018, Shodoshima Island, Japan. More information here. PALSEA2-QUIGS joint meeting on 'Climate, ice sheets and sea level during past interglacial periods', 24-27 September 2018, Galloway, New Jersey, USA. More information here. The 2018 joint 14th iCACGP Quadrennial Symposium and 15th IGAC Science Conference, 25-29 September 2018, Takamatsu, Kagawa, Japan. More information here. Ocean Optics Conference XXIV, 7-12 October 2018, Dubrovnik, Croatia. More information here. 2018 AGU Fall Meeting, 10-14 December 2018, Washington, D.C. More information here. IV International Conference on El Niño Southern Oscillation: ENSO in a warmer Climate, 16-18 October 2018, Guayaquil, Ecuador. More information here. The 6th Argo Science Workshop, 22-24 October 2018, Tokyo, Japan. More information soon. 2018 Ocean Salinity Science Conference, 5-9 November 2018, Paris, France. More information here. Conference on 'SPERA 2018: Bringing Environmental Radioactivity Research to Western Australia', 6-9 November 2018, Perth, Western Australia. More information soon here. The 1st Conference of the Arabian Journal of Geosciences (1st CAJG), 12-15 November 2018, Yasmine Hammamet, Tunisia. More information here. WCRP workshop on The Earth’s Energy Imbalance and its implications (EEI), 13-16 November 2018 in Toulouse, France. More information here. The 6th Sustainable Ocean Summit (SOS), Hong Kong, 14-16 November 2018. More information here. OCB Workshop on synthesis and intercomparison of ocean carbon uptake in CMIP6 models, 8-9 December 2018, Washington DC, USA. More information here. The Fourth Xiamen Symposium on Marine Environmental Sciences, 6-9 January 2019, Xiamen, China. More information here. 2019 IMBER Open Science Conference, 17-21 June 2019, Brest, France. More information here. The 2019 International Sea Ice Symposium, 19-23 August 2019, Winnipeg, Canada. More information here. The 13th International Conference on Paleoceanography, 1-6 September 2019, Sydney, Australia. More information here. A new IGAC TOAR paper published, Tropospheric ozone assessment report: Global ozone metrics for climate change, human health, and crop/ecosystem research. View the paper here. Special issue on the U.S.GEOTRACES Eastern Tropical Pacific Transect in Marine Chemistry available here. Conference report on Sea Level Conference 2017 is available here. Paper on Reflections on the CLIVAR Early Career Scientists Symposium 2016 published. View the paper here. EuroMarine call for Foresight Workshop and Working Group proposals. Submit a proposal by 31 May 2018. More information here. Call for proposals 'Marine Strategy Framework Directive - Second Cycle: Implementation of the new GES Decision and Programmes of Measures'. Submit a proposal by 20 June 2018. More information here. Joint NAM S&T Centre – ZMT Bremen Fellowship Programme for supporting scientists from developing countries to affiliate themselves with ZMT to upgrade their research skills and conduct joint research in Ecology, Biogeochemistry, Modelling and Tropical Coastal Marine Systems. More information here. The OCB SSC reviews travel support requests three times a year (deadlines in parentheses): Winter/Spring (March 1), Summer (June 1), and Fall (November 1). More information here. The AtlantOS video available here. The new Global Ocean Data Analysis Project (GLODAP) website is live. Visit the website here. Call for Review of 2018 SCOR Working Group Proposals. Comments are due by 1 August 2018. Details here. The ICES Working Group on Seasonal-to-Decadal Prediction of Marine Ecosystems is looking for new members. Details here. A open-access tool, called PREPdata, launched by the Partnership for Resilience and Preparedness (PREP), allows users to explore and map a wide range of data on climate change and society. Explore it here. ARICE Call 2018 for ship-time proposals requesting access to PRV Polarstern, CCGS Amundsen and RV Sikuliaq in the Arctic Ocean. Deadline for proposal submission 5th of July 2018. Details here. A new online resource from NOAA provides an interactive view of global satellite ocean color and true-color imagery. Details here.